We live in a society driven by debt. Cars, for example, have become hugely expensive (even on the low end) relative to what people can afford – because of the easy availability of credit. Which is the nice word used to speak about debt, intended to encourage us to get into it. It takes at least $15,000 or so to drive home in a “cheap” new car, once all is said and done. And the “cheap” car will have to be registered, plated and insured. And most new cars cost a lot more money. Which most people haven’t got. So they get debt. A loan. Which, when it becomes commonly resorted to as a way to live beyond one’s means as a lifestyle, drives up the cost of life for everyone. Including those who try to live within their means – or better yet, below them. When most people (when enough people) are willing – are eager – to go into hock for the next six years in order to have a car with an LCD touchscreen, leather (and heated) seats, six air bags, a six-speaker stereo, electronic climate control AC and power everything – which pretty much every new car now comes standard with – the car companies build cars to satisfy that artificial demand. Artificial because based on economic unreality. That is a good way to think about debt. It is nonexistent wealth. You are promising to pay with money you haven’t earned yet. The car market has become like the housing market – which has also been distorted by debt to a cartoonish degree. The typical new construction home is a mansion by 1960s standards. Not that there’s anything wrong with living in a mansion. Or driving a car with heated leather seats and climate control AC and a six-speaker surround-sound stereo and six air bags and all the rest of it. Provided you can afford it. Normally, that fact would keep things in check. There would be mansions, of course – and high-end cars, too. But only for those with the high-end incomes necessary to afford them. Everyone else would live within their means. 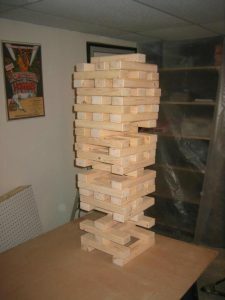 We wouldn’t be living in this economic Potemkin village that appears prosperous but is in fact an economic Jenga Castle that could collapse at any moment. There would be a lot less pressure to “keep up with the Joneses”… as they head toward bankruptcy and foreclosure. As society heads that way. Like the housing industry, the car industry has ceased building basic and much less expensive cars because of easy and grotesque debt-financing. There ought to be (and would be) a huge selection of brand-new cars priced under $10,000 were it not for the ready availability of nonexistent wealth (.e., debt and credit). Cars many people could pay cash for. Not shitboxes – as the late great Brock Yates christened them. They would have the build quality/body integrity and quality paint jobs that are now standard equipment with every new car, because of generally improved (and largely automated) manufacturing techniques, such as robotic welding and painting. Part of the reason yesterday’s low-cost cars felt shoddy – and rusted early – was because they were shoddily (and spottily) constructed. By often-aggrieved line workers, who maybe got a little too drunk the night before and so weren’t being very careful the next day, while fitting panels to the car. It’s not like that today – and irrespective of price point. The humblest new car is built to a much higher standard than top-of-the-line luxury cars once were. Those costs have been amortized; build quality would not regress if debt-financed flim-flam went away. To think it would is like thinking we’d go back to corded wall phones. They would have reliable, efficient – and not balky/hard-starting/stalling – engines, too. Because the cost of simple (throttle body) electronic fuel injection – an exotic technology back in the shitbox days – no longer is. It’s everywhere – economies of scale have made it so. Probably our less-than-$10k-car would have things like power windows and AC, if you wanted it. But wouldn’t it be nice if it were optional? None of this is pie-in-the-sky. Such cars are being sold all over the world right now, just not in the Western world – which is in debt up to its eyeballs. Because the debt lifestyle has been normalized. There now exists social stigma to live below one’s means. To not give the appearance of wealth one doesn’t have by purchasing – on credit – things one can’t really afford. That – as much as the regulatory burden of government – is what’s driving up the cost of life for all of us. Including those still trying to live within our means.